I haven’t done any of these meme questionnaires since February 2009. The instructions don’t mention tagging anyone, but I’ll call out alienlogic, Building a Better Me, and Open Laptop-Open Vein (all on my blogroll); feel free to change it up. Via Sunday Stealing. Was your dad named after anyone? Sadly, I’ve never asked, despite my fascination with genealogy. What do you think is the minimal age to get married? Can’t assign a number to that kind of thing. “Never” is really the best answer. What’s the longest time that you’ve been involved with the same person? 7 years. What actor/actress do you consider hot at the moment? No one really comes to mind! 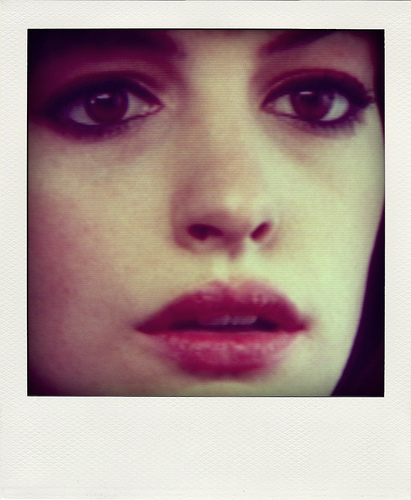 Anne Hathaway. What was the last TV show that you watched? Literally, America’s Got Talent. Working through Samurai Champloo (Hulu) and True Blood regularly. How many people have you met from the blogosphere? Who are they? Never met someone through the blogosphere, but the first person to come to mind is Fling93. He’s been trying to drive through Lou sometime this summer. What’s your philosophy on life? All things in moderation (from my dad). Do you think prescription drugs are over prescribed? Yes. Doctors should try, “Do 3 sets of 15 situps and see me in a week” instead. Would you keep a secret from me if you thought it was in my best interest? Define “secret”. What is your favorite memory in the last year? Weekend trip to Chicago, late October with Azung. Tell me one odd/interesting fact about you: I’m not good at arguing or yelling at all. You can have three wishes (for yourself, so forget all the ‘world peace etc’ malarky) – what are they? Ability to speak & understand any language, healthy knees (I’ve had cartilage repair too many times), & money of course. Who would you want to get together with and make a cake? Mom. Which country is your spiritual home? While I’ve never been there, the Netherlands seem just right. What is your big weakness? Apathy. Do you think Judd Corizan is a good person? ? What was your best/favorite subject at school? Wasn’t the best, but always loved art class. If you could change anything about yourself, would you? Better public speaker. What do you wear to sleep? Just underwear, sometimes pj’s in the winter. What is your favorite casual outfit to wear? Jeans and plaid button-down, as opposed to a grunge flannel. Do you use cigarettes or alcohol? See #10. Even though I may have one every year or so, the world could definitely do without cigarettes. If I only had one day to live, what would we do together? (If you have no idea, just say something crazy, it’ll entertain me!) Not sure who you and I are, but racecar driving against the right person would be quite a thrill. Rate the memes that you play generally. Use any scale or just in order. I tend to avoid them, although the music and book ones are usually fun. Memes seem to have lost popularity in 2010.